We all know that it is bound to happen eventually, but dread it all the same. Falling sick is part and parcel of life and as the saying goes, ‘what doesn’t kill you, makes you stronger’. There are billions of different viruses, bacterium and other compounds that can make us sick. Amazingly, for the most part, once your body has successfully defeated one of these viruses or bacterium, you are not likely to fall ill from that virus or bacterium again as your body would already know how to ‘fight’ them. 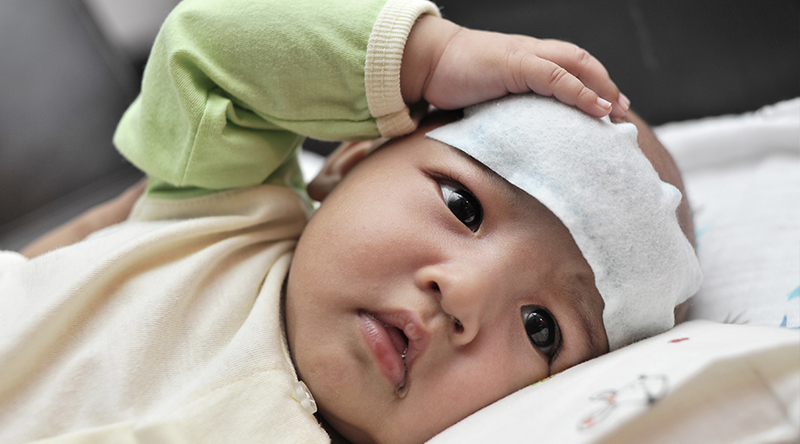 A lot of times, the first symptom that your child has fallen ill, would be a fever. Hence, having a good, reliable thermometer around is very important. Once a fever is detected, take note of your child’s temperature on an hourly basis. Babies below a year old with a persistent high fever above 38.5°C maybe admitted at KK hospital. Assuming that you have fever medication at home (commonly, it would be that sugary pink liquid known as paracetamol suspension), make sure you consult a doctor as to how much you should give to your baby. Also, check the label of the bottle and tell the doctor the concentration of the paracetamol suspension. Between my two kids, I had a few bottles of this medication but from different sources and I noticed that some were ‘paracetamol 250mg/5ml suspension’ (from Raffles Medical Paediatrician) while others were ‘paracetamol 120mg/5ml’ (from KK hospital). The first is slightly more than two times the concentration of the second and if given the wrong dosage, you risk over-dosing your baby on the medication. Keep the fever and/or other symptoms in check and call or bring your child to the doctor if you are unsure of what to do. The younger the baby, the quicker dehydration can take place and that can lead to fits, which is both scary to witness and could possibly have lasting damage on the young child. The following are some tips if your baby is unwell. 1. Your baby should stay away from crowds and/or other children, including siblings as far as possible, to prevent getting another infection while his/her immune system is down, as well as to prevent the spread of his/her infection. 2. Ensure that your baby is well hydrated, especially if he/she is feeding poorly. dont’t just give your baby plain water; try to give rice water or diluted milk. If your baby is feeding poorly and you try to hydrate him/her with only plain water, he/she will not have enough energy and feel very tired all the time. 3. If your baby is very tired all the time: sleeping much more than usual and is still lethargic when awake but has been feeding relatively well, take him/her to the hospital; the infection may be more serious than anticipated. 4. If your baby is both vomiting and having diarrhoea a lot, take him/her to the hospital. Dehydration must be prevented. If all goes well, after a few days, your baby’s fever would have subsided. Post-fever, it is common for children to break out in a full body rash. (If you use a little pressure and draw your finger over the rash, it should ‘disappear’ for a split second.) This rash, commonly known as ‘false measles’, is normal and will go away in a few days. However, if unsure, always consult a doctor.